Ethel Louise Rasmussen, the second child of ten children born to William “Bill” Murray and Mina (Newell) Murray, was born January 22, 1923, on her parents’ farm in Lincoln Township, Audubon County, Iowa and died February 6, 2019, at the Friendship Home in Audubon, Iowa at the age of 96 years and 14 days. Ethel was baptized and confirmed in the Lutheran Church. She attended rural Audubon County schools. Ethel enjoyed playing basketball in High School graduating from the Viola High School with the Class of 1940. On June 2, 1940, she was united in marriage to Clarence “Casey” Rasmussen in Maryville, Missouri. They were blessed with three daughters Patricia, Gloria, and Mary Lou. Ethel worked as a waitress at the Victory Café and candled eggs at the Parrott Produce. Later Ethel and Casey owned and operated the Montgomery Ward Store in Audubon for over 10 years until they sold the store. Ethel then worked in the kitchens of the Friendship Home and the Audubon Schools retiring after working for over 20 years in 1995 at the age of 73 and following heart by-pass surgery. Casey died in 1993. 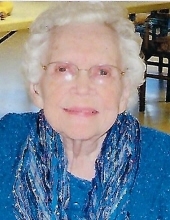 Ethel enjoyed living in her home until she moved to the Friendship Home in July of 2011. Ethel was a long time member of Our Saviour’s Lutheran Church in Audubon, Iowa and a member of the V.F.W. Auxiliary. Ethel and Casey co-owned a boat with friends and going swimming and water-skiing at Lake View. They enjoyed going to the horse races in Omaha, Nebraska and vacations in the Ozarks. Ethel enjoyed playing golf and was an avid Tiger Woods fan. She also enjoyed bowling, playing cards and sewing. Her favorite project was sewing outfits for plastic pumpkins and ghost heads for Halloween. Ethel traveled on many “Ladies Only” trips with her daughters, her sister Lois and Dorie, and her special friend Mary Hollister to California, Branson, Missouri, Nashville, Tennessee, and Wisconsin. Preceding her in death was her husband Casey Rasmussen; her son-in-law Eugene Johansen; her great grandson Adam Berry, her parents; and her brothers and sisters Roland and wife Inga Murray, Russell “Snowball” Murray, “Tootie “ and husband Mick Nissen, Merlin “Snooker” and wife Roma Murray, and Louie Murray. Survivors include her daughters Patricia and husband Don Matthews of Grinnell, Iowa, Gloria and husband Paul Melsha of Harper’s Ferry, Iowa, and Mary Lou Johansen of Audubon, Iowa; her 12 grandchildren Steven and wife Darla Matthews of Omaha, Nebraska, Jana and Payton Byers of Grinnell, Iowa, Todd Matthews of Sioux City, Iowa, Julie and husband Doug Berry and Penny and husband Dan Nunemaker all of Cedar Rapids, Iowa, Lisa and husband Mike Wiggins of Downs, Illinois, Brian and wife Connie Melsha of Swisher, Iowa, Scott and wife Kim Melsha of Palo, Iowa, Kevin and wife Angie Melsha of Cedar Rapids, Iowa, Casey and wife Kathy Johansen of New Milford, Connecticut, Chris and Jill Johansen and Rob and Sonia Johansen all of Dallas Center, Iowa; 32 great grandchildren; 10 great-great grandchildren; her brother and sisters Robert and wife Janet Murray of Beatrice, Nebraska, Betty and husband Lew Buckner of Audubon, Iowa, Lois and husband Owen Macke of Cedar Rapids, Iowa, and Dorie and husband Dallas Bald of Audubon, Iowa; her sisters-in-law Marlene and husband Kent Walters of Audubon, Iowa, and Lorraine Simpson of Council Bluffs, Iowa; her special friend Mary Hollister of Audubon, Iowa, nieces, nephews, other relatives and many friends. The family will meet with friends on Saturday, February 9, 2019, from 12:00 noon until the time of the service at Our Saviour’s Lutheran Church in Audubon, Iowa. Funeral services will be conducted by Pastor Ben Unseth on Saturday afternoon, February 9, 2019, at 1:00 p.m. at Our Saviour’s Lutheran Church in Audubon, Iowa. Interment will be in the Maple Grove Cemetery in Audubon, Iowa. The casket bearers will be Steven Matthews, Chris Johansen, Rob Johansen, Brian Melsha, Scott Melsha, Todd Matthews and Casey Johansen. To plant a tree in memory of Ethel Louise Rasmussen, please visit our Tribute Store. "Email Address" would like to share the life celebration of Ethel Louise Rasmussen. Click on the "link" to go to share a favorite memory or leave a condolence message for the family.